Indian River’s Emma Barthelmeis competes against Sussex Academy earlier this season. The Indian River High School boys’ swimming team has had one impressive season so far, and this past week continued those efforts with another two wins in a sweep of a tri-meet at the Howard Ennis School pool. On Thursday, Jan. 24, the Indians made things look very easy in nearly identical wins over visiting Delmarva Christian and Seaford. IR defeated the Royals, 78-15, and the Blue Jays, 78-14. 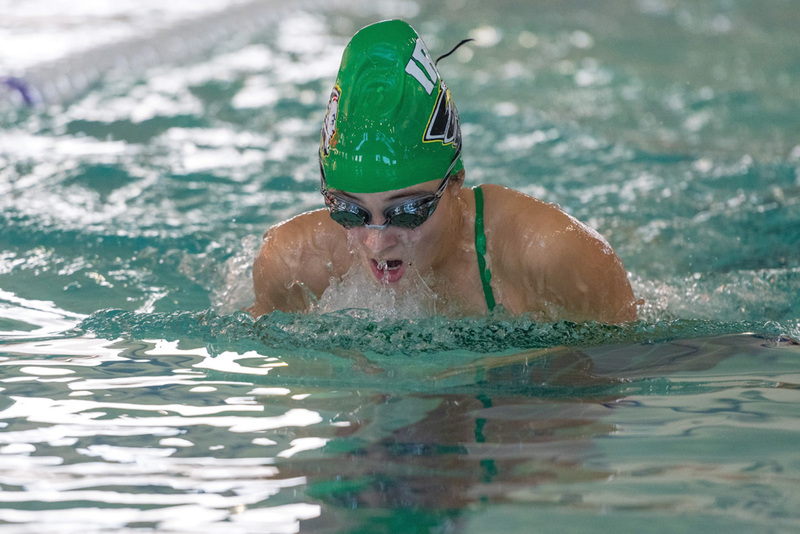 “We are still training hard, and they may be swimming a little tired,” head coach Colin Crandell said. “I was pleased with their times. This week,” he said of the pending meet on Wednesday, Jan. 30, versus Sussex Tech (after Coastal Point press time), “we have some injuries and will be down a few swimmers. However, our goal is still the conference meet on Feb. 9. In the meet with DCHS, the Indians won all but one event. Sophomore Declan Burke was a three-time winner for the Indians, with individual victories in the 100 breast (1:14.03) and 100 butterfly (1:07.08), and a relay win in the 200 medley. He teamed up with Mitch McGee, Dylan Tuttle and Bastain Perry in the 200 medley (1:51.98). McGee was also an individual winner in the 200 individual medley (2:28.61). He also swam a winning leg in the 200 free relay (1:38.66) with Tuttle, Max Kohr and Sam Miltner. Other individual winners included Will Douds (200 free, 2:12.03), Liam O’Leary (50 free, 25.47), Zach Lingenfelter (100 free, 56.68) and J.D. Johnson (100 back, 1:10.03). Miltner, Ethan Forrey, Derek Hillis and Finnegan Bellistri combined to take first place in the 400 free relay with their time of 4:33.00. Against Seaford, the Indians won every contested event, with Burke picking up four more wins in the meet. Kohr swam a winning 500 free with his time of 6:23.27. Kyle Beebe, Jackson Donnelly, Johnson and Perry were winners in the 400 free relay, covering the distance in 4:36.25. The Indian River girls’ swim team had a successful week as well, with sweeps of Delmarva Christian and Seaford on Thursday, Jan. 24. Emma Barthelmess continued her winning ways with two individual and two relay victories to her credit. She won the 100 free (1:02.56) and 100 breast (1:17.45) before swimming successful legs in the 200 medley relay and 200 free relay. Barthelmess, Kaitlyn Kreiser, Amber Hills and Emma Kelly were victorious in the 200 medley relay with their time of 2:21.73. Barthelmess, Kelly, Alex Hall and Emma Rickards teamed up for the win in the 200 free relay (2:02.73). Hall also picked up a win in the 50 free with a 28.36 time. She also swam a leg in the winning 400 free relay, joining Kreiser, Hills and Kelly for the top spot. Hills rounded out the winning efforts with a first-place finish in the 500 freestyle with her time of 7:37.10. Against Seaford, Hall added a win in the 200 free (2:41.07), while Kelly was a winner in the 200 IM (3:04.05). Madison Bemis picked up a first place in the 100 butterfly (1:39.98). Kreiser was victorious in the 100 back event with a 1:29.91 time. IR had little trouble in their 61-14 win over Concord on Friday, Jan. 25, thanks in large part to their guests’ five forfeits. Colin Hudson (120 pounds), Will Keller (170), Zach Schultz (195), T.J. Burke (220) and Ramond Turner (285) each had their hands raised without breaking a sweat, due to the forfeits. The Indians dropped just three individual matches in the win. Chris Saylor (106), Ian Shaubach (113) and Will Rayne (126) all picked up wins by pin fall. Ta’Jon Knight added a technical fall at 132. Cole Windish (145) and Reshawn Turner (152) posted back-to-back identical 10-2 major decisions in their matches. The Indians also hosted Sussex Tech on Friday, Jan. 25, as part of the tri-meet of action on the mats. That time, though, things were a bit closer, with IR pulling out a 41-31 decision. Saylor (106) and Rayne (120) sandwiched their pins around a tech fall for Shaubach (113) to get the Indians off to a strong start. Knight (126) followed with a pin of his own before Christian Lopez (132) edged out a 10-9 decision in the five-match flurry to start. Reshawn Turner (152) got the slap in 3:16, for another big win. Keller (182) picked up a 3-2 decision, and Schultz (195) followed with a pin to close out the victory for IR. Sussex Tech also defeated Concord in the tri-meet, 58-18. On Monday, Jan. 28, the Indians hit the road for a match at Cape Henlopen, and the Vikings were not very welcoming, sending IR home with a 47-25 loss. It was just the second loss in dual meets for the Indians on the season. IR found themselves in a 13-0 hole after the first three matches on Monday, but they were able to dig themselves out of the early hole. However, Cape won the final six matches, to finish off the divisional crossover contest. Ramond Turner (285) started the Indians’ initial comeback attempt with a 3-1 decision. Saylor followed with a forfeit win at 106. Shaubach (113) got the slap in 3:53 for their third straight win, erasing the early deficit. Hudson pinned his way to victory at 120 in 3:09, and Rayne was the last of IR’s successes on the day, with a 9-1 major decision at 126. The Indians will hit the road for a match with rival Sussex Central on Friday, Feb. 1. Results will be found on the Coastal Point sports Facebook and Twitter pages.